Annoyingly, there’s more from whites up in arms that the many Confederate monuments to slavery defenders are being removed all over the country, a small but significant attempt at atonement aimed at the millions of African Americans who were enslaved here. On Saturday, more than a few “protesters,” including punched-in-the-face-twice-moron Richard Spencer, gathered in Lee Park in Charlottesville, Va., wielding torches and chanting, “You will not replace us,” “Blood and soil,” and, strangely, “Russia is our friend” (cuz they are true Caucasians?! Or cuz Trump?). “Either way, as mayor of this city, I want everyone to know this: We reject this intimidation. We are a welcoming city, but such intolerance is not welcome here,” he wrote. In April the Charlottesville City Council voted to sell the statue of Confederate Gen. Robert E. Lee that stands in the park. 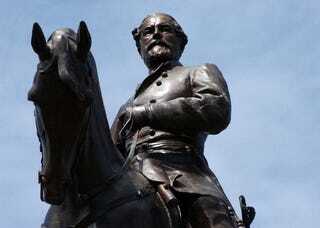 The city also announced plans to rename Lee and Jackson parks, named, respectively, for Lee and Stonewall Jackson, yet another Confederate general. A judge issued a temporary injunction on the statue’s removal, but as with the city of New Orleans, with its own plans to remove Confederate statues, it’s only a matter of time before the statue is taken down. Farewell, goodbye and dasvidaniya to ya. Read more at the Daily Progress.